Viovanni Larocca (Anthony Quinn), governor of the city of Casamare, Italy, is accused by his rival, Count Dimorna (Wilton Graff), of profiting illegally from a recent war with Austria. Larocca murders the count in a fashion that suggests suicide and announces that Dimorna was a traitor. 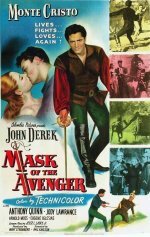 When the count's military officer son, Renato (John Derek), returns home from the front, suspicious of Larocca's actions, he becomes the masked daredevil the Avenger, who aims to expose the city's corruption.